← What’s the big deal about food? 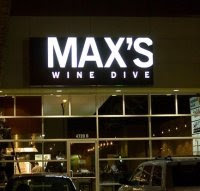 Max’s Wine Dive is definitely one of the most unique concepts in Houston dining. Well known among both Houston foodies and the see-and-be-seen hipster set, Max’s bills itself as “Haute Dogs and Shiraz, Kobe Burgers and Cabernet, Fried Chicken and Champagne.” In other words, upscale comfort food with a knockout wine list. Max’s culinary chops have enjoyed a generally good reputation in Houston. However with the departure of founding chef Jonathan Jones a couple years ago, there was some of talk about Max’s losing it’s edge in the food department (scenester department is always going strong it seems). In stepped new chef Michael Dei Maggi. Unapologetically tattooed, hyperkinetic, boisterous and seemingly destined for a slot on Top Chef someday, Chef Dei Maggi has shown a steady, creative hand in Max’s kitchen. His spring tasting menu event was well-received by the elite foodie community (ha!). That’s right folks, molecular gastronomy comes to Houston. In a recent post on the Food in Houston blog, the lack of a true molecular gastronomy restaurant in Houston was lamented. As if on cue, Chef Dei Maggi announced his molecular dinner. You have to give Chef Dei Maggi credit for ambition and audacity. If the execution lives up to the menu descriptions (60KB PDF), this should be interesting. I’ll be attending and taking plenty of pics and hopefully live-tweeting the dinner. For adventurous foodies this is a must-attend dinner. It’s pricey at $200pp, but it is comparable to the 7-course tasting menu with wine pairings at Textile. Plus you are supporting and encouraging a local Houston chef who is willing to take chances and push boundaries. Reservations can be made by calling 713.880.8737. This entry was posted in Blog Only, Food, Food for Thought, Restaurant Reviews and tagged max's wine dive, michael dei maggi, molecular gastronomy. Bookmark the permalink. plinio – agreed and acknowledged that RR and Textile have been doing MG techniques for the last few years. I guess what I’m referring to and what anonymouseater is referring to in his blog post about the lack of an MG resto in Houston is perhaps an issue of marketing and perception. If someone from out-of-town comes to Houston and asks where is the best MG restaurant, the current answer is “there isn’t one” (but as you point out it would be quite accurate to say that RR/RL and Textile use MG techniques). So it’s interesting that Chef DeiMaggi is both cooking a top-to-bottom MG dinner with the associated techiques and marketing it as such. Why? Maybe he just wants to create buzz, experiment with different techniques, get out of his comfort zone. Or its even possible they are testing the waters for interest in a Houston MG resto in both technique and marketing (proceed cautiously I’d say!). I'll email you with great info about food and travel. All submissions are private. Dude, you going to eat that?